We all want to live a healthier life. Eat healthy and exercise more are often at the top of anyone’s to-do lists. But that shouldn’t be where those lists end. Because what we put on our bodies and use in our homes is just as important as what we put in our mouths and what we do with our bodies. Making healthier choices includes choosing products that are free of harmful chemicals. The ingredients in personal care products are not always required to be monitored or approved by the FDA, which leaves each of us wide open to risk. The average woman applies about 15 personal care products a day (men about six), exposing herself to hundreds of toxic chemicals each day before she even leaves home. Many everyday products include parabens, petrochemicals, phthalates, sulfates, artificial dyes, synthetic fragrances and other harmful ingredients that are linked to chronic illnesses. A toxic-free life is simply better for your health. Swapping just a few of your current products for safer versions can make a big difference in your life and the lives of your loved ones. But where do you start? Cleanser: A key ingredient in our Cleanser (and Moisturizer) is organic rose flower distillate, which is known for its anti-aging, oil control, anti-inflammatory and moisturizing properties. It refreshes the skin without leaving it feeling tight, and it’s rich in antioxidants, which helps keep skin youthful and healthy. Moisturizer: Our Moisturizer nourishes skin with antioxidants, conditioners, emollients and oils known to help achieve radiant skin and improve elasticity. Cetearyl olivate and sorbitan olivate are unique natural emulsifiers derived from olive oil that are highly moisturizing, hypoallergenic and promote moisture retention. Shampoo: The ingredients in our Shampoo include organic aloe vera juice, which contains enzymes that directly promote healthy hair growth and has anti-pruritic properties that can help alleviate itching and dryness. Conditioner: Among the amazing ingredients in our Conditioner is organic coconut oil, which hydrates and protects hair from heat and chemical damage and provides the essential proteins required for nourishing damaged hair. Shave Gel: Enriched with organic aloe vera juice and natural oils, our Shave Gel softens hair for easy, clean removal. Ingredients include decyl glucoside, a soap derived from coconut and non GMO corn, which is gentler on skin than regular soaps and offers easier glide. Dream Cream: In our Dream Cream, organic shea butter, naturally rich in vitamins and minerals, helps to soothe, hydrate and balance skin, plus promotes skin renewal, increases circulation and accelerates wound healing. Spearmint Lip Balm: The organic shea butter in our Spearmint Lip Balm helps heal and protect, while organic coconut oil works wonders on dry and damaged skin and spearmint leaf oil soothes. Surface Cleaner: The ingredients in our Surface Cleaner include coco-glucoside, a foaming agent derived from coconut oil and fruit sugar, and lemongrass essential oil, which is an excellent household cleaner with antifungal properties. Master Blaster: Mannase, lipase, cellulose and protease are plant-based cleaning enzymes used in our Master Blaster to break down organic matter, while sodium bicarbonate (baking soda) neutralizes acids and breaks down proteins. Say “Yes!” to safer ingredients. Make the switch to toxic-free products today. Do it for yourself and your loved ones. 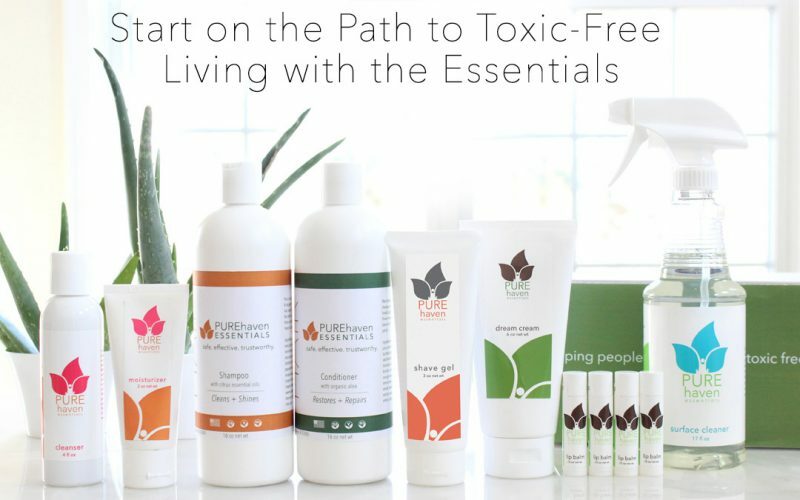 Contact your local Consultant for more information about how you can live a toxic-free life, or visit purehaven.com.